To train myself to paint better, I’ve been taking on commission work from various players in our community. 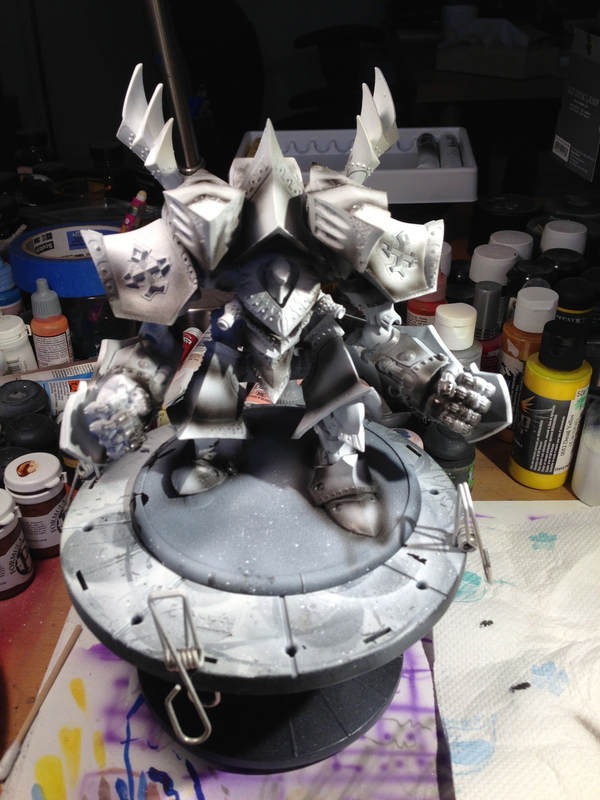 Painting models from other factions, and game systems, is a great way to challenge oneself. This particular project was sponsored by Zach, who asked me to paint a Judicator, the colossal for the Protectorate of Menoth. His instructions were simple: inverse the studio color scheme and go nuts. As a start, I have learned that an airbrush is not only a tool for speeding up the painting process, but also as a mechanism to add special effects with ease. The airbrush I used for this project is an Iwata HP-C. 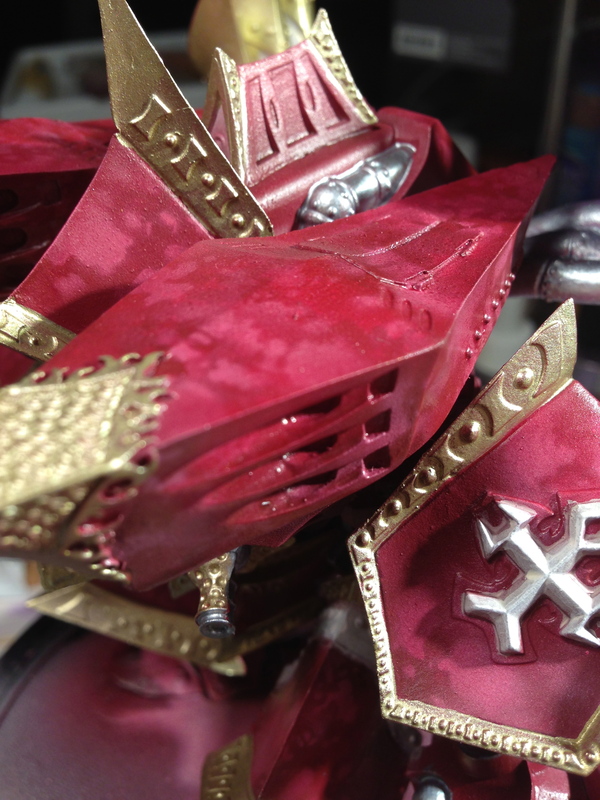 I know from my experience that painting red can be challenging because of the issues with shading — highlight red with your typical method of adding white color only makes the model look pink; adding yellows or warm shades, pushes the model to orange. 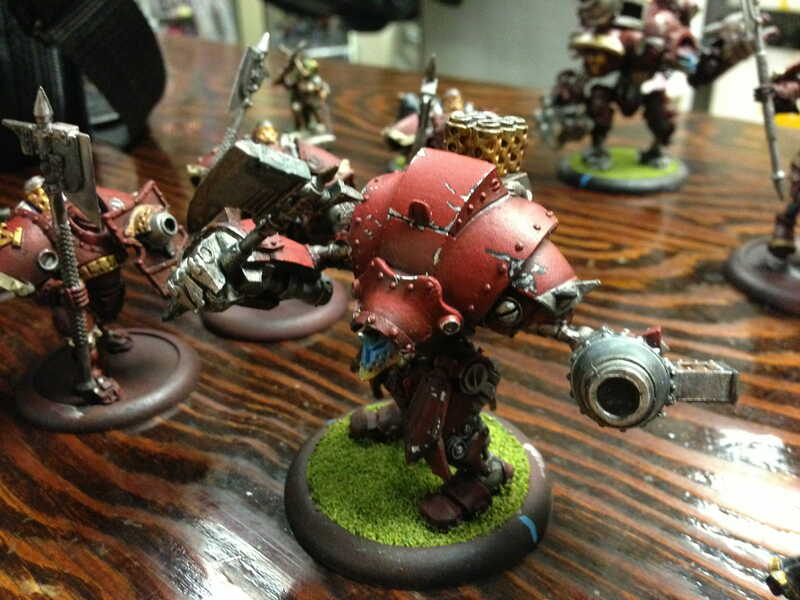 I painted this Khador Destroyer several months ago. The current owner based and flocked the model with a green tone. Pink and orange are not colors we aim for when we want red. I learned this, of course, the hard way when I was painting a Khador army, which is mostly red. Instead, when working with primary colors, blues, reds, or yellows, a good idea is to start very dark and “highlight” with your main color. This step would be fairly easy with a regular paint brush, too. 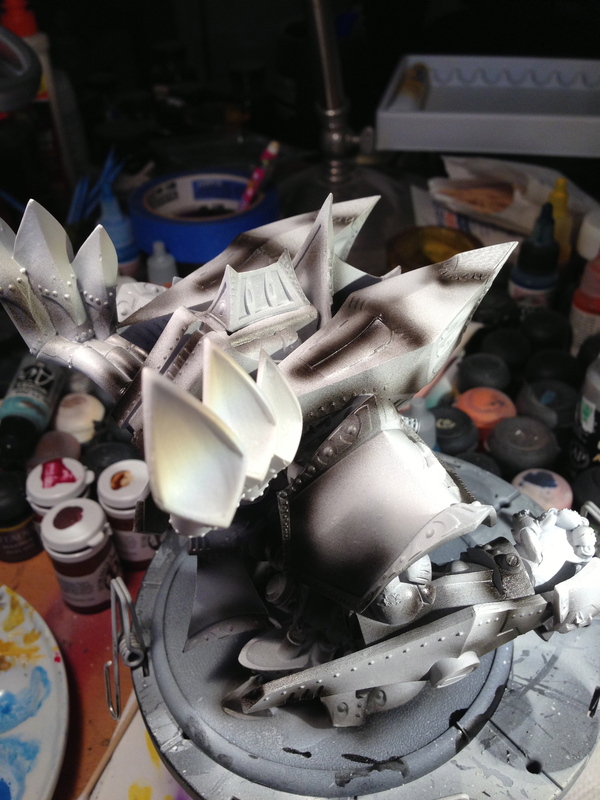 White primer with dark gray shading applied with an airbrush. Here’s what I mean on the Judicator. Airbrush dark areas with liberal trigger use and you get a nice outline/framework for what’s going to be the darker areas when the color is added. Then, when all is done here, just layer in your colors. I think this the technique that pros use to airbrush cars and motorcycles (i.e., flame effects). Red layered on top of the white/black undercoat. This is still shiny because I just varnished it as a bookmark for the next effects I wanted to add….you can see the subtle hints of the black showing through on the legs and feet. This is a very nice way to get shading on quick and the blends are very smooth. 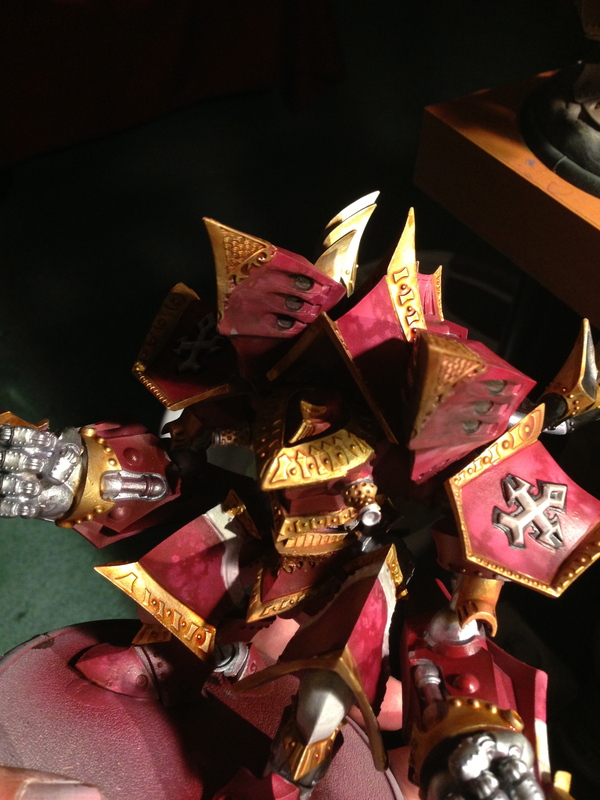 It works because the airbrush is able to apply such thin, translucent layers of color. Each layer merges seamlessly with the one below it. Of course, as I started painting and layering I realized that the red would be “flat” and kind of boring. Adding metallics and the white accents would not have improved my impression of this piece without something “else”. So taking the airbrush I started free-handing some shapes in white. I think I could have done this with a brush, but it wouldn’t have been as smooth. After a bit of free-handing on the surface, I realized that I need sharper edges. So I started using a stencil, which was kind of hard to use against the non-flat and curved surfaces. Anyway, I flubbed around a bit…. And then of course, I didn’t take any pictures because I’m silly and forgot (my apologies). I kind of zoned out and had tunnel vision when I was doing this step. This tends to happen when I get an idea and run with it. Anyway, time flew by and suffice it to say, in hindsight I wasn’t sure what I was doing exactly; but if I had to explain, I think I was going for a layered effect to give more depth to the red without losing the overall contour of the armor plating. It ended up like the pictures below. The brightness of the red I took down with very thin washes of a darker brownish/red color (I think it was P3 Sanguine Red). Then, the metallics were added on top. While I’m not done, I think by the bottom image we’re close to 80% finished. Overall, I’m quite happy with the results. I had a goal in my head for “how-to” paint the red base color. Then, I decided midway through the painting process that it needed more. 1) Red is a strong color that demands respect and doesn’t like to play well with bright color mixes (it’ll turn pink, lavender, or orange very quickly). 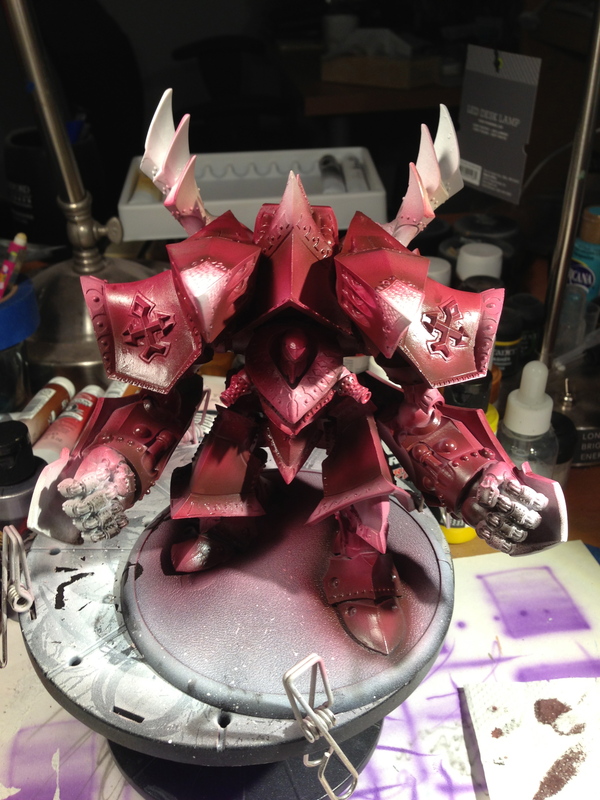 2) An airbrush has more uses than simply base coating and varnishing. 3) Sometimes a plan falls apart into something better. It’s all coming together. Almost there! Previous Post Painting…Get it Done.